These are great for polishing jewelry or other metal working uses. .Suitable for most ferrous and non-ferrous metals, castings, welded joint .Accessories for fine detail work on jade, ceramic, glass, wood, hardened steel, cast iron, stainless. Ideal for for home improvement, hobby, craft and whenever you need to polish, grind, drill, cut, engrave, and more. 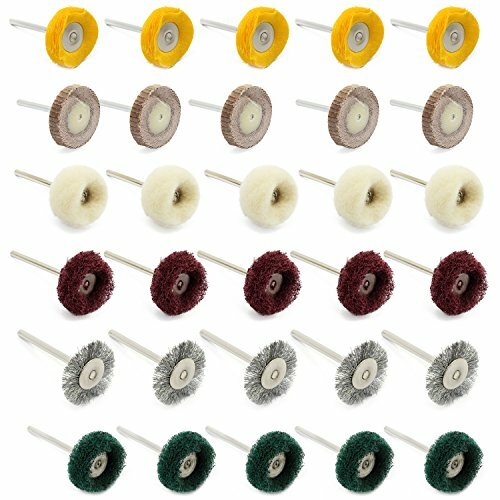 1.Polishing pad buffing wheel brushes mixed set steel wire brush wool wheels for Dremel rotary tool. 2.Made of good quality material:Great tools for detailed works with hard and delicate materials. 3.30PCS polishing wheels,5 of each type in pack;Shaft diameter: 3mm. 4.Easy to use: compatible with many rotary tools, and suitable for metal surface cleaning, dusting, polishing, buffing, derusting, grinding, stripping residue and other jobs. 5.Package includes 30pcs rotary tool accessories for grinding, sanding, sharpening, polishing,cleaning, to meet your various DIY application requirements. If you have any questions about this product by WiMas, contact us by completing and submitting the form below. If you are looking for a specif part number, please include it with your message.